Hiya guys! You ever feel like you are barely clinging on to life itself as your know it? Yeah, that's me right now in an acetone filled frenzy haha. I'm super exhausted after doing nothing, but swatching nonstop for the last three weeks or so. But first thing is first, yes I am back to round shaped nails after a few months! And I am actually loving every second of it. Yup, for once in my nail life I actually chose to round them instead of being forced due to a break. The change of shape though really came in handy these past few weeks though as I powered through swatching the 2-Year Anniversary Shenanigans for Supermoon Lacquer. Today I'm actually sharing three new shades part of this extravaganza, the Shenanigans Duo and Group Exclusive! Yeah... one word... Wowza. It really feels like words cannot not describe just how beautiful all three of these are so... I'll let the polishes do the talking and we'll get right to the swatches! 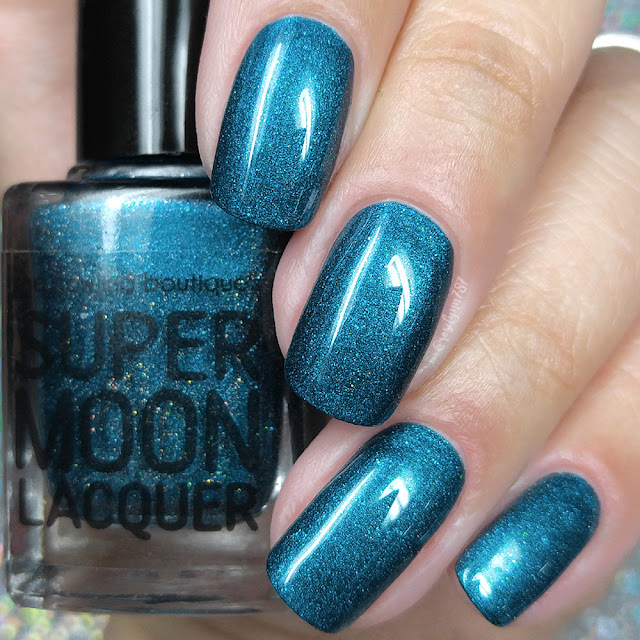 The Shenanigans Duo and Group Exclusive by Supermoon Lacquer will be available Friday, July 13th at 6:00pm CST through Friday, July 20th at 11:59pm CST. Each full-size 12mL shade in the duo will retail for $12 or you can pick up the duo set for $22. The group exclusive shade will retail for $10 each, but only when you have the discounted code available in the Facebook fan group. So head on over to join! Plus there will be 60+ polishes available to choose from including previous PPU installations and limited beta batches. Deimos can be described as a deep red-violet based, holographic red/orange/gold multichrome filled with purple-to-copper aurora shimmer, magenta-to-copper, red-to-yellow, and violet-to-gold color shifting shimmer, purple pearl and pink-to-gold microflakies, and silver holographic microflakies. Yes, we are starting off this review and I am already feeling myself drooling. It should come to no surprise though, this brand has become a my favorite of mine at this point. The color to shimmer combination blend seamlessly and create such a eye-catching depth. It's so very rich and complex, I feel like I am gushing over it. But it's so well deserved and just imagine how much better it looks under direct sunlight. That's where it truly comes to life. Plus it looks so good against my skin-complexion, it's like the perfect tone to not cause any clashing. A very rare occurrence for me when it comes to this color family. The formula has a very opaque application that can easier be a one coater. For swatching purposes I personally prefer a second thin coat just to make the finish come more to life. Just a thin second coat goes a long way in terms of adding more shimmer and sparkle. The consistency feels well balanced, not too thick or too thin. It dries down to a minimal gritty finish that smooths out perfectly after topcoat. I would also like to note that I experienced no staining on removal to either my cuticles or nail beds. Definitely a huge plus when it comes to such an opaque polish. Shown in two coats and sealed with a glossy topcoat. 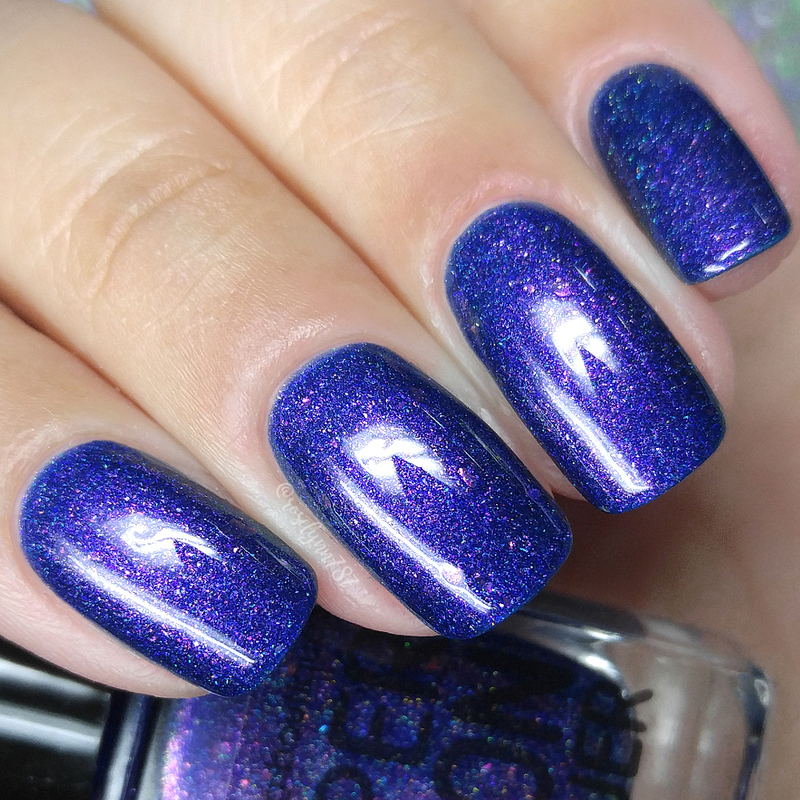 Phobos can be described as a bright blue based, holographic teal/blue/purple/red/gold multichrome packed with cyan-to-indigo and green-to-purple aurora shimmer, green-to-red and teal-to-purple color shifting shimmer, and silver holographic microglitter. If the last shade made you drool then this one should have you in a grave, haha. I have said once and I'll say it again, Mardi absolutely kills it when it comes to anything in the blue/teal family. Definitely a must-have and a great introduction to this brand if you haven't made a purchase before. The combination of the shimmer and holographic glitters make the finish have an almost magically glow. Not almost, it's most definitely magically haha. And like the previous shade, this looks so stunning against my skin-tone. Actually it's one of those colors that just works perfectly against any skin-tone in my opinion. All the more reason this shade is a must-have and needs to make it into your cart. The formula has a really opaque application and can easily be a one coater. Like the previous shade, I simply like adding a second thin coat for more sparkle in the finish. Consistency wise it's well balanced, not too thick or too thin. Super easy to work with and layer. It dries down to a minimal gritty finish that smooths out after topcoat. And ready for the best surprise of all? I ended up experiencing no staining on removal to either my nail beds or cuticles. Again it's a huge plus with no only this base color, but also considering how opaque the pigmentation is. Shown in two coats and sealed with a glossy topcoat. 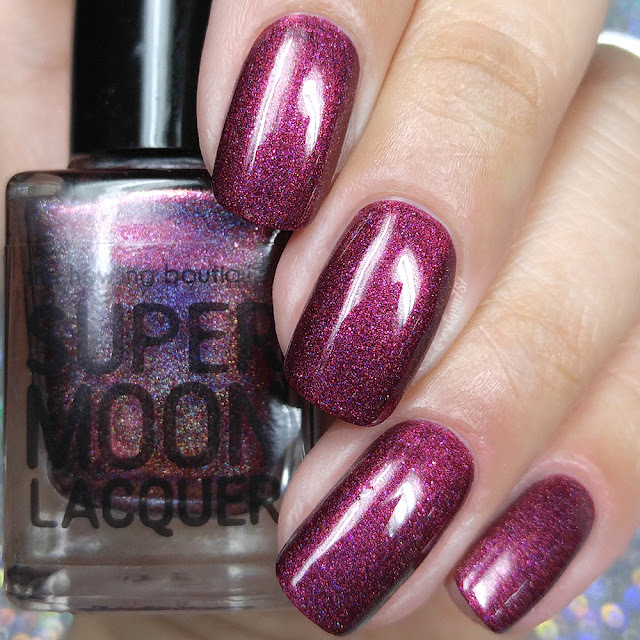 Now the following shade is an exclusive to the Howling Boutique's Wolf Pack group on Facebook, so be sure to head on over and join cause you're going to want this beauty! Pulsar Wind can be described as an indigo-blue jelly base with magenta-to-gold aurora shimmer, pink/violet/red/copper and red-to-yellow color shifting shimmer, silver holographic microflakies, and purple/red/gold crystal chameleon flakies. If you've made it this far without your jaw dropping then this is the one here to straight up kill your wallet/soul. Say hello to (I believe) the first ever jelly finish Mardi has created to date. The shimmer to color combination give such a complex dimension to the finish. And this is nothing compared to how it looks like under direct sunlight. This cannot be missed! Plus the color once again looks great against my skin-complexion without bringing out too much warmth. The formula has a sheer application as intended for a jelly finish. The coverage and build-up are absolutely fantastic and leaves behind no visible nail line. So impressive for a jelly, especially if you consider this is Mardi's first. Like the others, consistency is right on par and is neither thick or thin. The sparkle is so much more vibrant in person and especially under direct sunlight. 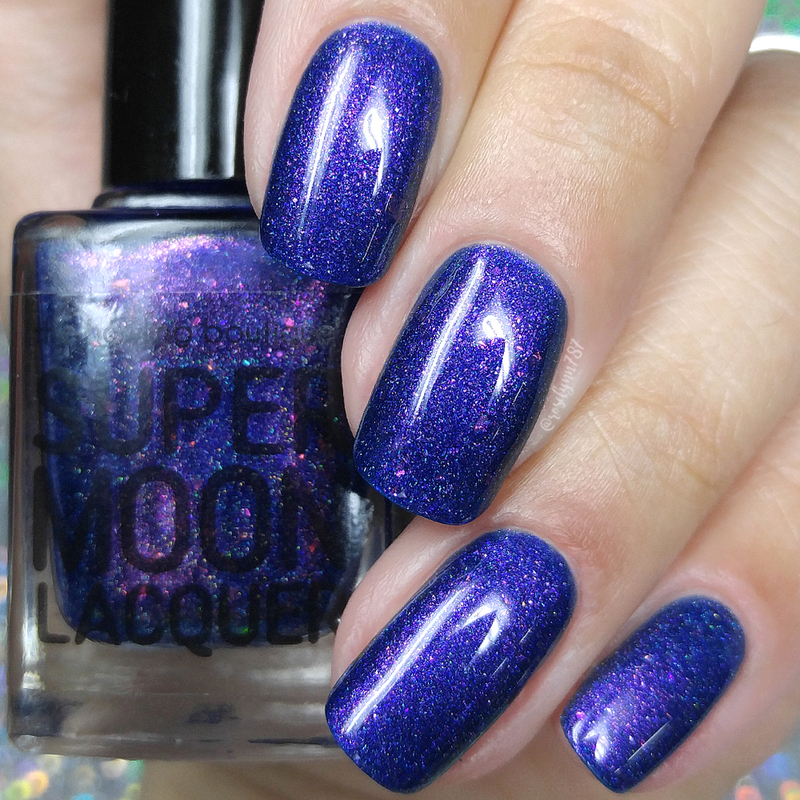 As I mentioned before, the jelly really compasses the shimmer to give it such a glowy squishy effect. It dries down to a minimal gritty finish and smooths out perfectly after topcoat. Once again there was no staining on removal to my cuticles or nail beds. Shown in three coats and sealed with a glossy topcoat. 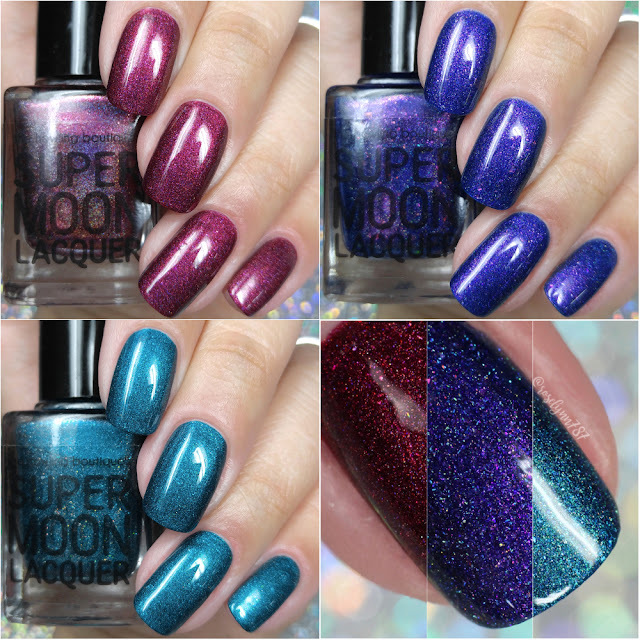 To recap, the Shenanigans Duo and Group Exclusive by Supermoon Lacquer will be available Friday, July 13th at 6:00pm CST through Friday, July 20th at 11:59pm CST. Each full-size 12mL shade in the duo will retail for $12 or you can pick up the duo set for $22. The group exclusive shade will retail for $10 each, but only when you have the discounted code available in the Facebook fan group. So head on over to join! Plus there will be 60+ polishes available to choose from including previous PPU installations and limited beta batches.